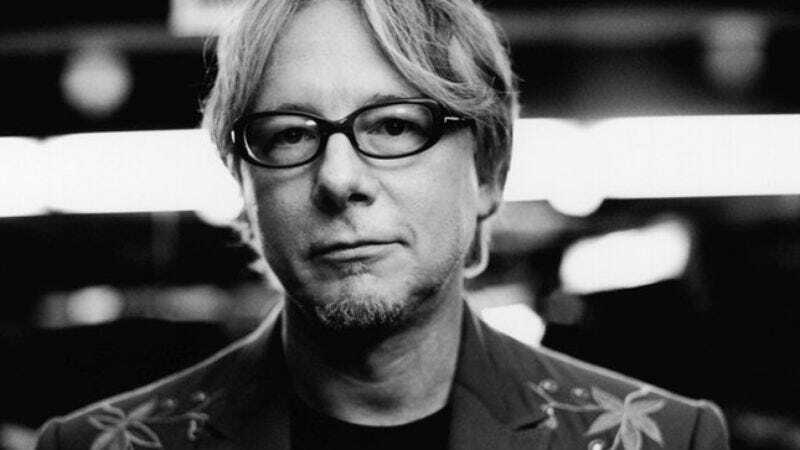 For 31 years, Mike Mills was R.E.M.’s distinctively bookish-looking bass player. His apperance has changed over the years—he grew his hair long and started wearing Nudie suits as R.E.M. became one of rock’s biggest groups—but he was always an integral part of the band’s sound, adding high haromony vocals to Michael Stipe’s iconic murmurs and filling out the arrangments with chamber-pop orchestrations. R.E.M.’s career suffered after its popularity peaked in the early ’90s, but with this year’s Collapse Into Now, many fans believed the band sealed a comeback that began with 2008’s Accelerate. In spite of clues embedded in the album’s lyrics—from “All The Best”: “It’s just like me to overstay my welcome”—few suspected that, behind the scenes, Mills, Stipe, and guitarist Peter Buck had secretly decided to pack it in rather than re-up their record contract with Warner Bros. R.E.M. finally announced its breakup in September, and in recent interviews, the band members have firmly re-iterated that this isn’t a prelude to a reunion tour or another comeback record. R.E.M. is finished, and its members are moving on. Before that, though, there’s a new R.E.M. greatest-hits album to promote: Part Lies Part Heart Part Truth Part Garbage 1982-2011. The two-disc set covers 40 R.E.M. songs, including three new tracks, though fans will inevitably find essentials missing. (No “Perfect Circle”? No “Pretty Persuasion”? No “Near Wild Heaven”?) Mills recently talked about the compilation with The A.V. Club, as well as the reasons behind R.E.M.’s split and what songs he’d like to survive the nuclear apocalypse. The A.V. Club: It’s been two months since the breakup announcement, and the band has been very clear about saying, “This is it, we’re finished.” A lot of times when bands break up, they don’t make an announcement, or they say they’re going on hiatus. Why was it important for R.E.M. to say unequivocally that this breakup is permanent? Mike Mills: Because if you don’t, it just seems very manipulative. It’s like you’d be building hopes and expectations for the next record you’re secretly planning to do, or for the next tour that you’re secretly planning to do, and we’re just trying to be straight-up and honest about it and say that we are actually finished, and we have no plans to ever tour again as a group. AVC: Don’t you think there’s a possibility that in, say, a year or two, you’ll wake up one morning and want to make another R.E.M. record? MM: I doubt it. I mean, I could get hit by a bus tomorrow, but I don’t see that happening. We put a lot of thought into this, and we realized that we’ve accomplished pretty much everything we could hope to accomplish. We’re going out on a high note—I think we just made two of our best records, and we’re going to walk away on our own terms as friends, with no negativity involved. It just seems like the right thing to do. AVC: You’ve said that the band talked about breaking up going as far back as 2008, when you were touring for Accelerate. What prompted those initial discussions? AVC: You’ve talked about the friendship at the core of this band. Has being in R.E.M. ever put a strain on that friendship? MM: Considering that, without the band, we wouldn’t have a relationship, the only way to answer that is to say “Of course, in any relationship, there are ups and downs.” Being in the band itself hasn’t put a strain in the relationship, because there wouldn’t have been one otherwise. So what happens is, as with any marriage or family you have, you’re going to have to down years, but being the stubborn guys that we are, we just waded through those and got back to higher ground. AVC: Did you know while you were making that Collapse Into Now that it was going to be your last record? MM: Yeah, we were pretty sure about that. There are hints on the record in some of the lyrics. The cover is the first one all three of us have ever been on, so we were playing with that a little bit. Because we pretty much decided the time we were well into that record that it would be it. AVC: Now, it seems obvious—Stipe is even waving goodbye on the cover—but were you surprised when people didn’t pick up on that when the record came out? MM: Yeah, actually. I was a little surprised that there wasn’t a little more speculation about that, but I think that the thing is, it would never occur to anybody that a band would break up voluntarily. Usually it’s some outside force or some negative event or traumatic happening that causes a band to break up. Who would expect a band to walk away when they’re hitting creative heights? But that’s just what we decided to do. AVC: What was it like making Collapse Into Now and recording the new songs for the greatest-hits record, knowing they were the last R.E.M. sessions? MM: We tried to enjoy it as much as possible and make it as fun as possible, but we’re not super-sentimental people in that sense. The only time we got really poignant was when we were working in Berlin, and they have a beautiful room there, Meister Halle, where we recorded seven or eight songs. There was no one there really except some friends, family, and significant others, and we knew that was probably the last time we would ever play together as R.E.M. That was a pretty fraught day. [Laughs.] But it was fun. The atmosphere was almost totally positive, because we are walking away on our own terms after accomplishing all that we wanted, and we’re all very excited about the future, and we’re all still friends. We can all still have dinners and bottles of wine together. There’s really very little that’s negative about this. AVC: When the breakup announcement came in September, there was a big public outpouring of love for the band. Because R.E.M was around for so long, did you ever feel that you were taken for granted? MM: It’s not something I would have dwelt on, but of course it happens. Any time you stick around for that long, people just assume you’re going to be around forever. But I never lost any sleep over that, because people are people and they do what people do. AVC: Did you read any of the tributes that came out after the breakup? MM: I read a few. You know, it’s very gratifying to know that people were affected by what you did. I really enjoyed Pearl Jam doing one of the songs from Collapse Into Now—that was very cool. You want to leave a positive mark on people, and to have that shown to be true is really nice. Having said that, I didn’t sit there and read every single thing I could find about what people said, because this is a big enough deal about making it a bigger deal in my own head. AVC: Are you still processing the breakup in your mind? It seems like you’re at peace with it, but have you fully accepted that you’re not in R.E.M. anymore? MM: I think so. I’m very much at peace with it. Everybody feels really good about our decision. It feels like the right thing to have done. You know, that doesn’t mean I won’t have a nervous breakdown in two months. [Laughs.] But right now, I think everybody’s okay with it. AVC: Do you foresee collaborating with the other members under a different name or set of circumstances? MM: Oh yeah, I wouldn’t be surprised. There could be any number of things. One thing I do want to do is write songs with people, and since Peter and I have always written songs together, we might continue to do that at some point. I would not be surprised at all. AVC: Now R.E.M. has this greatest-hits record coming out. Has this been an opportunity for you to reflect on the legacy of the band? MM: Not so much. The overriding feeling among Peter, Michael, and myself is excitement for the future. We’re plenty young enough to have a lot of creative years left. Now we can do anything that comes to mind. I think it’s much more about looking forward than it is about looking back, surprisingly, even at this particular time. When we made the announcement, all three of us were in very different places, literally, but we all had dinners with dear friends or family or both, and I could see us three raising a glass that same night, but just not with each other, which is kind of interesting. AVC: How involved was the band in picking the songs for this compilation? MM: Oh, it’s totally our decision. It’s the three of us who chose them, and decided which ones went on and which ones didn’t. We were really excited to have three new ones that we really liked that we could put on that to us kind of show the three facets of R.E.M. : We’ve got one kind of goofy song, and one slightly harder-edged song, and then the beautiful, wistful, mid-tempo ballad. AVC: Was the idea to sum up the band on one album? MM: One way of looking at it was, if some 12-year-old kid had heard of R.E.M. but didn’t really know anything about it, and wanted to have a nice overview of what the band was, from basically the beginning up until this year, you would have it right there. Or if the Martians landed after the nuclear holocaust, and the only thing they could find was this two-CD set of R.E.M., they’d understand what we were about. AVC: Are there songs that you would have liked to include that didn’t make it? MM: You know, the only one I kind of miss is “Find The River,” because it’s such a beautiful song. But there are four songs from [Automatic For The People] on there already. We really wanted the song, but there are time limitations, even on CDs. Something had to go, and that was just one. AVC: Going back to that nuclear-holocaust scenario, if you were only going to leave behind one proper R.E.M. album, which album would that be? MM: [Laughs.] Well, you know, there are certainly some obvious ones that people would think. But I say leave Reveal out there and have people find that, because I think that’s a very underrated record. MM: You know, we never had a problem with that song. We always thought it was fun to write a happy song. Nobody writes super-happy music, so we decided to do that. The only thing we didn’t like about that song was that we didn’t want that to be our legacy song. We didn’t want it to be the one that people think about when they think about R.E.M. It’s a great song, and I’m proud of it, but it wasn’t fun to play live, because we didn’t have Kate Pierson out with us. So there was really not much point in doing it. AVC: The two songs that are probably most identified with you personally are “(Don’t Go Back To) Rockville” and “Nightswimming.” Do those songs hold a special place in your heart? MM: Oh yeah, of course they do. “Rockville” is written about a real person, although the situation was certainly not fully true to life. And “Nightswimming” is a beautiful piece of piano music that Michael was inspired to write some incredibly beautiful lyrics to. I’ve done some fun things with “Nightswimming.” My friend Robert McDuffie is a violinist who has established a music school at Mercer University in Macon, Georgia, a school for strings, and I went down and performed. He had a friend arrange it for a string quartet, and he plays the vocal melody on his violin. We went down and presented that as part of a classical program, and that was pretty thrilling right there. AVC: “Nightswimming” is a great example of how the members of R.E.M. collaborated, with you writing the piano part and Stipe those evocative lyrics. MM: Well, that’s the essence of the band. That’s one reason Peter, Michael, and I stuck it out all of these years in difficult times, because we knew the best work we would ever do as musicians is the work we do within R.E.M. I mean, we all do great things alone, but our life’s work was this band, and the way the band works is the collaboration between the four and then the three of us, and that’s something we enjoyed and respected. AVC: What won’t you miss about being in R.E.M.? MM: I always hated doing videos, but I haven’t been in an R.E.M. video in years. Peter and I told Michael, “Go and make any video you like, just don’t make us be in it.” So that’s the only thing I really didn’t like. I don’t mind doing interviews. I don’t love having my picture taken, but that’s not going to be a problem now. AVC: Over the course of R.E.M.’s career, the music industry has changed dramatically. Do you think it’s still possible for a band to have the same kind of impact that you guys had? MM: If I can say this without sounding like an egotist, I doubt it, because the Internet dilutes music so much. You don’t have a giant record company pushing a band. You don’t have the limited radio stations that people can listen to. People have so many more places to go find their music and go listen to their music that I think it becomes what they call the long tail. I think there are going to be a whole lot of bands with successful but smaller careers, which is great. I think the Internet has totally broken down the walls between the bands and their fans. I think in a way, that will make it easier for bands to have careers. I just don’t think it will be easy to be really big like U2 or we have been over the years. AVC: R.E.M. has always been supportive of new and emerging artists. Are there new bands you’re excited about? MM: Well, you know, Athens is full of them still. Wavves are great. I just heard a song by a band called Real Estate that I really liked. AVC: Real Estate has been compared to your band a lot. MM: Oh, well there you go. [Laughs.] I only heard the one song. I bought the record, but I haven’t had a chance to listen to it yet. The Low Anthem is doing some pretty cool things out there. I think it’s a good time for music. AVC: Looking to the future, do you have any specific plans in place, music-wise? MM: I’m looking forward to writing with a bunch of different people whose music I admire. I could see doing a solo record, although there are no concrete plans for that. The only thing that is planned is my friend Chris Stamey, who is in a band called The dB’s, is a Big Star fan, as are many musicians I know, and he has a project we have performed two or three times already, where a bunch of musicians get together and perform Big Star’s Third record. We’ve got a couple of shows in Europe planned for next year already, and I’m very excited about those.